I love how serious we look. how tired you guys look, and the pajama action…whoa!! tube socks over the jammie feet for you chad, and nate….major hole-age in the knee area. love how seth is carefully examining the sword hilt. oh yeah. 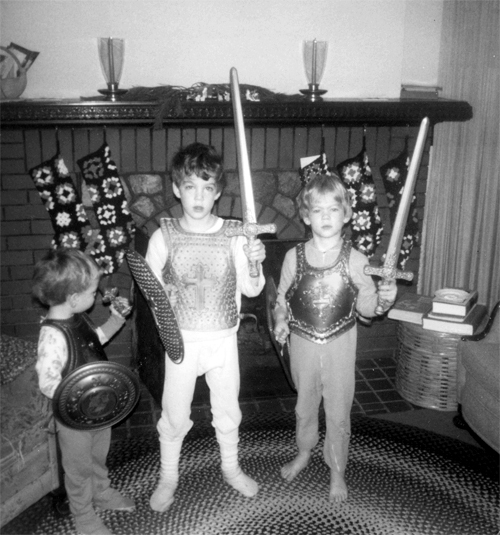 those swords are one of the few christmas presents that are permanently locked in my memory. man I’d love to be able to predict what sorts of toys will stick in my kids memories, I would only buy those ones! ma….love to see more. i know you got em….are the daily’s the weekly’s? :-). Love to see what’s zoomin cross your mind.